With a stay at Atlantic Paradise Inn and Suites, you'll be centrally located in Myrtle Beach, within a 5-minute drive of Family Kingdom Amusement Park and Myrtle Beach Boardwalk. 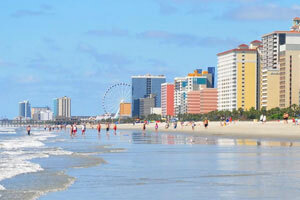 This beach hotel is 1.9 mi (3 km) from SkyWheel Myrtle Beach and 3.2 mi (5.2 km) from The Market Common. Make yourself at home in one of the 75 air-conditioned rooms featuring refrigerators and microwaves. Complimentary wireless Internet access keeps you connected, and cable programming is available for your entertainment. Bathrooms have shower/tub combinations and hair dryers. Conveniences include phones with free local calls, and housekeeping is provided daily. The preferred airport for Atlantic Paradise Inn and Suites is Myrtle Beach, SC (MYR). The property is closed between 07 October and 21 March.